Last week I went on a fishing trip to Pine Island Lodge. The lodge is located on a small island on the Winnipeg River in Canada. Although the main focus was fishing with the family (it was great fishing, I caught a 39" Northern Pike and Kim earned a Master Angler certificate for Smallmouth Bass), I also realized the skies were going to be dark and with no moon. So naturally I brought my "grab & go" astrophoto rig -- the Canon XSI and AstroTrac mount. My travel rig fits neatly into a backpack and into the overhead bin on the plane, while the tripod stows in the checked bag. 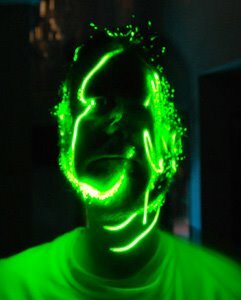 Fortunately, I was not given any grief by security (the AstroTrac might take some explaining). One thing I learned about being this far north in the summer -- it only gets dark between about 12:30am to 3:30am. So I woke up around 1:30 and shot for about an hour. 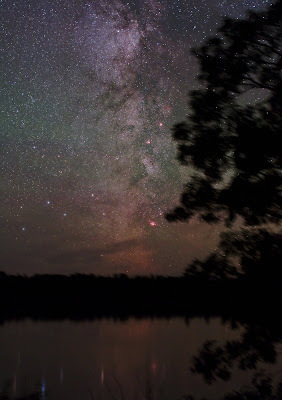 I wanted to get the Milky Way over the Winnipeg River, so I fought mosquitoes to get this single exposure (2 min) shot. 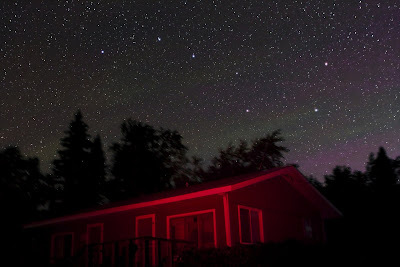 I then noticed the Big Dipper parked nicely over one of the cabins, so I shot another 2 min exposure. Notice anything interesting about these shots? Although they were too faint to see naked eye, I picked-up the Northern Lights! They were faint but definitely there. I processed the Milky Way image first and thought the odd green cloud might be the aurora but was unsure. But when I saw the cabin image it was obvious. Anyway, a really great trip and a nice surprise upon returning home! 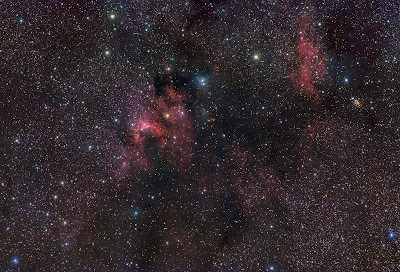 Here is my image of the Cave Nebula in the constellation Cepheus. Why is it called the Cave? Hell if I know. Apparently somebody saw a "cave" in here somewhere. I'm expecting there to be a whole slew of Michael Jackson nebulae catalogued soon. Anyway, I shot this image last month (the same trip as my previous 2 images). I did not really have quite enough data to pull all of the detail I wanted, but it is still pretty. I must adopt a bit more patience and spread my imaging of these faint targets over several nights. But it is hard! 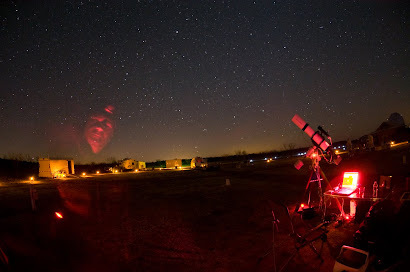 The sky is filled with so many cool objects I want to see more! Ah, but just looking at some other images of this target with 8 hours of data (compared to my measly 4) is motivation for patience -- they are very impressive. 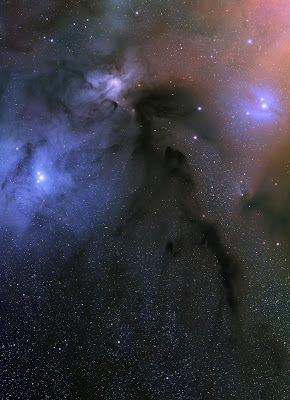 The Rho Ophiuchus area is HUGE, and this is only a "small" piece of it that fits in my field of view. As such, it almost feels like we are inside of it. You may recall (or not) that I imaged an extremely WIDE field of this area along with the entire Scorpius constellation back in April -- my "Scorpius Rising" image. Anyway, this is a much tighter shot that focuses on some of the incredible dark and dusty nebulosity found there. I had some issues collecting the data for this image (clouds, trees, gradients, tequila) but after a bit of processing I was able to arrive at something I like. Heck, I love it! Space is just so damned neato (feel free to quote me on that).